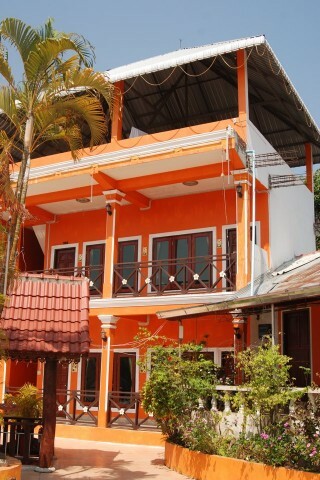 Set right on the Mekong next to the slow boat dock, Phonevicith’s more expensive, newer rooms have terrific views across the river to Thailand and boast sparkling floors, new beds with reasonable quality linen, cable TV, WiFi and a few bits of furniture. We think it’s a tad better than Riverside Houaysay Hotel in terms of friendliness, character and brightness – the new rooms get lots of natural light and because of this they have a very clean feel to them. Room #109, the corner room closest to the river, has a wraparound balcony and a wide unobstructed view. The older rooms are quite dark and a bit dated, but not bad value all things considered. The hotel can also arrange tours or drivers. There are few eating options up this end of town including their own attached restaurant, however the 1.2 kilometre walk into town might just be the tonic you need if you’ve just arrived on the slow boat with stiff legs. Likewise, those staying in town should be tempted to make the trek here for a meal with a view. Note: this hotel confusingly also goes by the name Houayxai Riverside and is often confused with Riverside Houaysay Hotel, which is located in the heart of town. Check rates at Phonevicith Guesthouse on Booking.com.